I could write about 'special counsel' ........but as Jeffrey Toobin says........this could go well into 2018. So, I'll have to pace myself. Unfortunately, I've run out of time on thinking of a blog post. I never do enough nonsense posts. But I can still keep it Dump-embarrassing and make a reader laugh..........or shudder. Or both. now they need a whining winnie doll, cause that's all he seems to do ("I'm so persecuted!"). 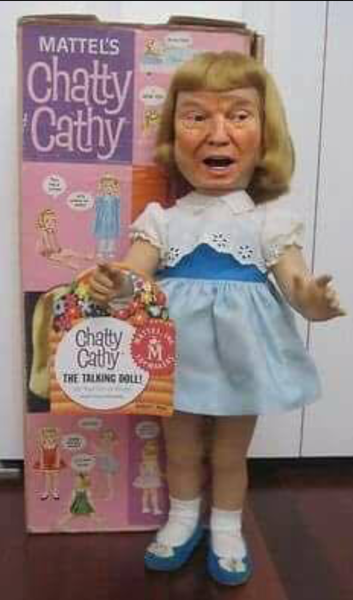 That is one motherf%king scary doll. Laughing out loud over here. Thanks we needed a chuckle. Okay, that's going to give me nightmares! Well the hairstyle is an improvement.